Vitamin E is an antioxidant nutrient that may help prevent damage to cells in your body. Other roles of vitamin E include helping your immune system and various metabolic processes. Foods such as almonds, spinach and mango contain vitamin E, but your doctor may recommend a vitamin E supplement. One type of supplement is vitamin E oil. If some of the oil comes in contact with your eye, you should know the signs of a possible reaction. Vitamin E oil in the eye may not cause any discomfort, but some people may notice irritation. You may notice redness, discomfort and excessive watering, a condition known as allergic conjunctivitis. 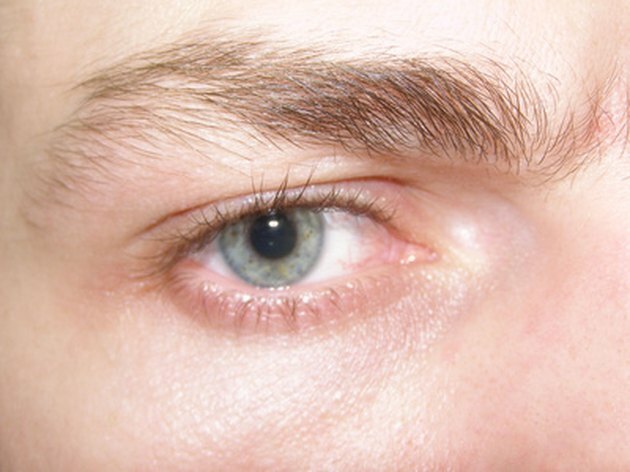 Severe reactions may also result in inflammation of the tissues around your eye, including your eyelid. Even if you do not experience discomfort associated with the vitamin E oil in your eye, you may notice vision changes. Many liquid forms of vitamin E have an oily texture, and the oil may cover your cornea, the front window of your eye. This could result in blurring. Your natural tear film may gradually wash out the vitamin E oil, but until the oil dissipates, you may continue experiencing vision changes. Once you no longer have any traces of the oil, your vision will likely return to normal. If vitamin E drops touch the surface of your eye, you may not need to take any action. The drops will blur your vision, but they will not likely cause significant discomfort. However, if you do have a reaction to the vitamin E drops, you should flush your eyes with water. You can do this with tap water, or you can use saline or artificial tears to clear the vitamin E from your eye. After you wash the oil from your eye, contact your doctor for an evaluation. She may prescribe an eye drop or other treatment to prevent inflammation or further irritation. Vitamin E is a beneficial nutrient for your health and may help prevent certain eye conditions such as macular degeneration and cataracts. You should avoid instilling vitamin E drops into your eye since this may cause a reaction and distort vision. To have the appropriate intake, your doctor may recommend foods rich in vitamin E or a daily supplement. Your doctor will inform you of the amount of vitamin E appropriate for your health and prevention of eye disease. Can Tea Tree Oil Cause Blindness?